Master Butcher. First worked for Jack Banks, butcher on Halliwell Road. He then set up business in Crescent Road. 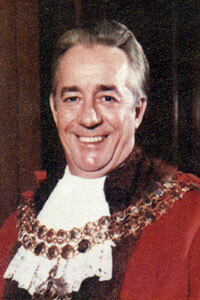 Known as Jack, he represented Great Lever Ward 1958-61, Bradford Ward 1962-80 and Derby Ward from 1980. Honorary Alderman of Bolton Metropolitan Borough, admitted 2002. At different times Chief Whip of the Labour group and Deputy Leader. Chairman of the Planning and Engineering Services and the former Planning and Industrial Development Committees. As Mayor he signed the Twinning agreement between Bolton and Paderborn in West Germany. He opened Farnworth Baths in 1975. Established Bolton's First Economic Strategy in 1982, working with the private sector and attracting £125 million to regenerate the town centre. He was an early champion of environmentally friendly policies and projects in the town, involving innovative partnerships between the Council and businesses, schools and community groups. As Chairman of Planning and Engineering Services he was known as Mr Environment. He introduced various initiatives including Roadside Care. 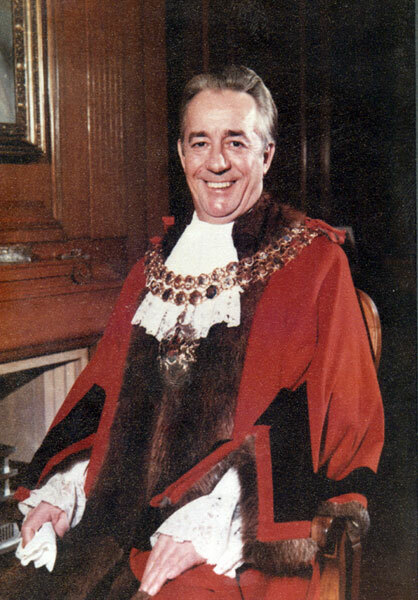 During his term of office the Department won several awards including the Green Apple Award 1999, the Tidy Britain Silver Broom Award, People and Places in Action, European Sustainable Cities and Towns Award and the Queen Mother's Birthday Award for Environmental Achievement. The Department were also National Spring Clean Competition winners. He received a personal award from the Tidy Britain Group in recognition of his contribution to Local Government. Represented Bolton No 3 Ward on Greater Manchester Council 1973-86. Chairman of Bolton Water Works Committee, becoming a Member of the National Executive of the British Waterworks Association in 1962. President of the British Waterworks Association 1971-72. In 2000 he was presented with a Civic Pride Award by the then Mayor of Bolton Alan Wilkinson for his contribution to Bolton's environment. His hobbies were fishing and sailing. For several years he had a small yacht on Lake Windermere where the family spent their weekends. Anglican - he worshipped at Emmanuel Church. His wife, Joyce, was Mayoress. Formal portrait of John Arthur Foster as Mayor of Bolton. 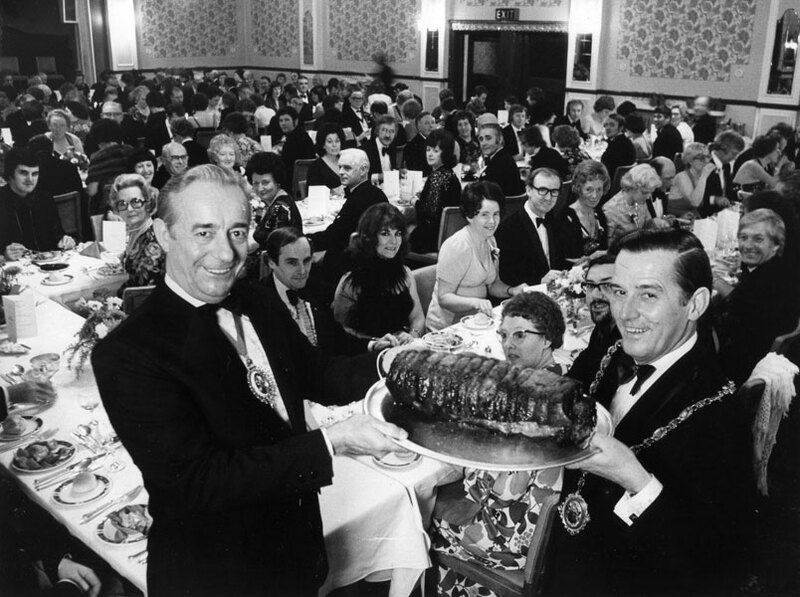 Jack Foster attending the Bolton Butchers Association dinner as Mayor of Bolton. 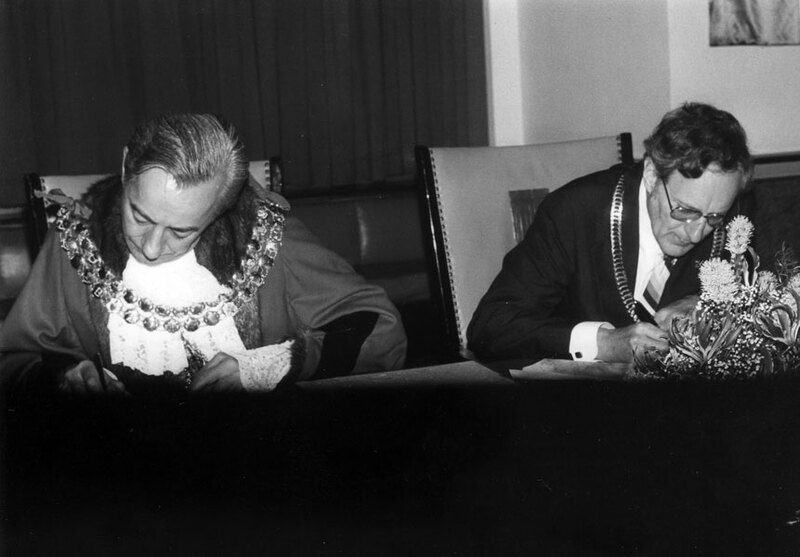 Jack Foster as Mayor of Bolton signing the Twinning agreement between Bolton and Paderborn in West Germany, alongside the Mayor of Paderborn. 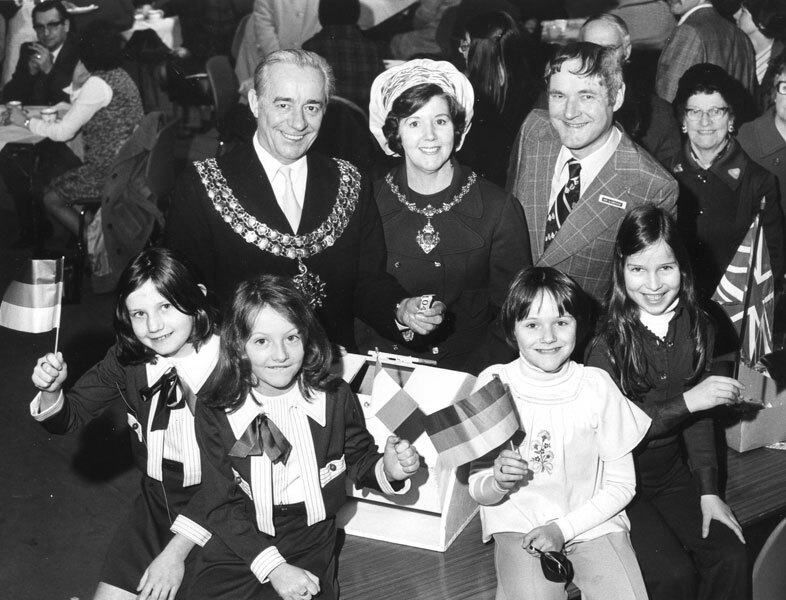 Jack and Joyce Foster as Mayor and Mayoress of Bolton with a group of schoolchildren at a town twinning event. 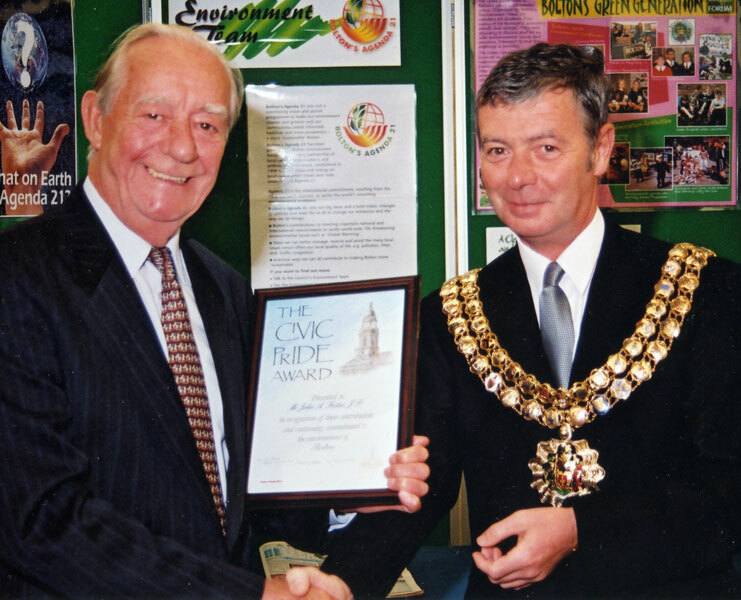 Jack Foster being presented with a Civic Pride Award in 2000 by the then Mayor of Bolton Alan Wilkinson for his contribution to Bolton's environment.